High Quality Solid Wood Fireplace Shelf Mantel by Duluth Forge. The 60-Inch wide mantel is perfect for small to medium size fireplaces. 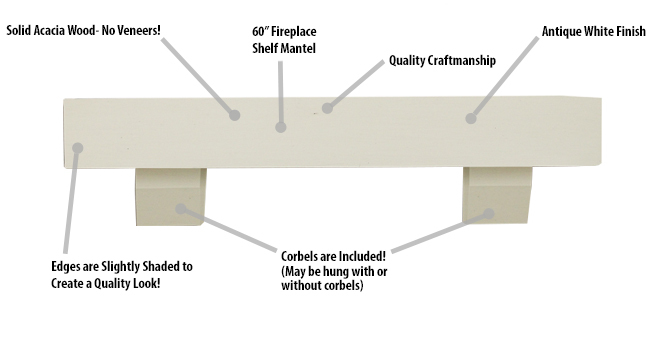 The shelf mantel is perfect for gas fireplace inserts, wood fireplaces, stoves and much more! These wood shelf mantels can be used without a fireplace as well. The 9 in. shelf depth allows for plenty of room for displays which makes it perfect for any area of your home needing additional storage or a decorative touch. Easy to hang, all mounting hardware is included for a floating shelf look, and you can choose to use with or without the included corbels. Use the corbels for a tradition look and without for a more modern look. Product is made of solid Acacia wood – No veneers! Note: Wood is a combustible material. Please review heat clearance specifications before installation. Consult your local building codes and manufacturer information regarding your specific insert or stove.